Drive with pride: support white shark research and public safety programs! Your car will sport an exclusive design by Paul McPhee, one of the nation's top marine life artists, who's work can be frequently seen on the covers of the most prestigious sports fishing magazines. 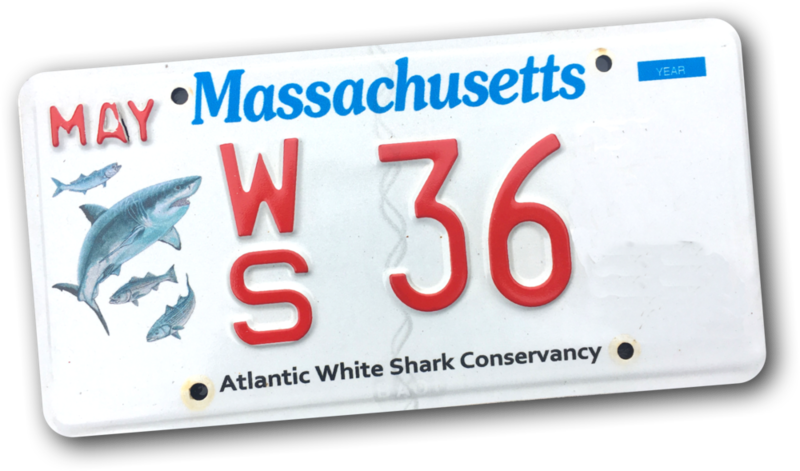 $28 of the special plate fee is tax deductible and donated to The Atlantic White Shark Conservancy, supporting white shark research, education, and public safety programs. When you renew your plate after two years a full $40 plate fee is donated. Click the button below to register and purchase one at the Massachusetts RMV. Make sure you select "White Shark" plate! BUY IT NOW 2-digit plates!